Ignite your creative spark and gain confidence controlling your paintbrush, mixing colours, and getting that paint to flow like a pro! Enrol now to get started! Start here! 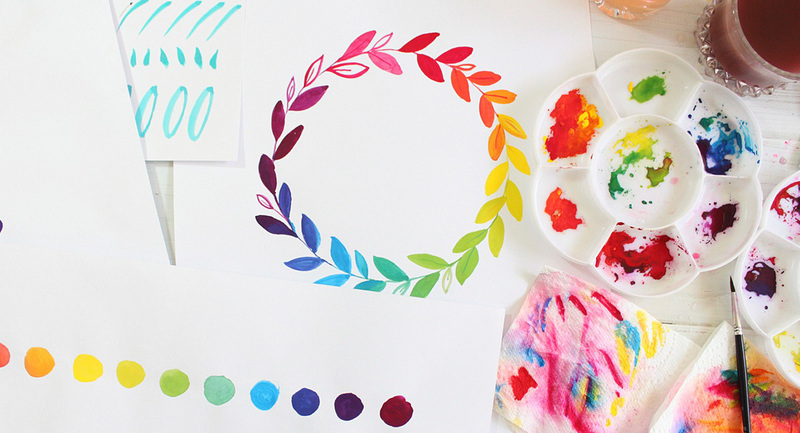 This jam-packed course will teach you everything you need to know to get started with gouache. And the best bit? Get Started With Gouache is FREE to join, so enrol below to gain instant access! Do you ever feel the urge to explore your creativity a little further through painting? Have you ever wished there was a painting medium that just wasn’t so hard to use as a beginner? Have you been all inspired and sat down to paint with watercolours, but ended up with a blurred puddle of muddy colours and a soggy page? Maybe you’ve tried acrylic paint, but found it stiff and hard to work with. And what’s with that streaky finish? And why is it impossible to add little details! Have you tried gouache, but found it really weird. You just can’t figure out what you’re doing wrong? In this course, your creativity will be kickstarted as you learn all about gouache, it’s properties and uses, how it differs from other painting mediums, and why it’s a winner for beginners! Through a series of creative exercises, you’ll gain control of your paintbrush, mix your own colours and get that paint flowing! You’ll be painting beautiful, vibrant artworks with gouache in no time! You want to learn to paint, but you waste so much time clicking around through Youtube tutorials, or searching Google for snippets of relevant information and trying to piece it all together? You have 30 tabs open with random, boring and only partially helpful videos, and you're getting confused and frustrated because you actually don't know what steps to take next.. and so you end up doing nothing? You find yourself a bit lost in academia, confused by big words or overwhelmed by colour theories that are complicated and hard to understand? And you're not even sure if the person on your screen actually knows what they're talking about? You follow artists on Instagram, and you'd love to know what brush or paper they're using, or if they're using watercolours or gouache, and you'd love to know HOW they DID that but you don't want to be that person who always asks those questions. Besides, you've summoned the courage and asked once before and... nothing. Why this course is different? ✔︎ Everything you need to know is in ONE place. Get Started With Gouache includes a series of easy-to-follow, high quality video lessons from an experienced artist, showing you a combination of supplies and techniques that really works. Get Started With Gouache includes 'follow-along' lessons because doing is the best way to learn! There are action items at the end of each module to help you implement basic techniques given, as well as cheat sheets and practice sheets to build your confidence. Get right down to business with your brush, mixing all of the colours of the rainbow just from 3 primary colours. Learn to adjust colours on your palette intuitively by using the included Colour Mixing Cheat Sheet as a guide. ✔︎ Help is at Hand! Watch the videos, download the PDF cheat sheets. Ask questions and share your progress in the Get Started With Gouache community. You're not on your own, help and support is available anytime and those questions won't go unanswered! If you’re not convinced that Get Started With Gouache is for you, allow me to convince you with some glowing reviews..
“I had fun going back to the basics (brush practice, color mixing) as I tend to do to much at once. You made me feel comfortable with a new medium, I'm definitely gonna use it. It might even be better than watercolor. I really like the setup: Clear chapters, convenient pdfs and very instructive video's. Great you can do it in your own pace." "Short videos, great lighting & camerawork, clear easy lessons, step by step tutorials, great PDFs, inspiring colours, making it simple and approachable, fun rather than perfectionist approach, great colour chart lesson, and a lovely inspiring project at the end. You're a wonderful presenter and have done an awesome job! You were also so generous in giving the course for free as an introduction to your work!" "I love painting with acrylics and watercolor. This medium has opened up so much for me in the painting world and I'm so thankful! I have discovered that I love gouache! The videos and the PDF tools were wonderful! My favorite part was the subject of color blending/mixing. I would have been lost without the supply list so an extra special thank you for that!!" Love trying new things and exploring your creative side? Join hundreds of other creative adventurers who have found a whole new world of colour and creativity with gouache! Get Started With Gouache now! Get Started With Gouache is FREE! Enrol Now! I bought my first set of gouache paints for design college over 10 years ago! It was on the materials list, so I got a set of primary colours. We never actually used it though, and my little set of gouache paint got pushed to the back of the cupboard. I developed as a fine artist painting with acrylic paint on huge canvases, and I forgot all about gouache. Fast forward a few more years, and I find myself living on a really remote island in Indonesia. Because we accessed our island home by a tiny seaplane with strict luggage restrictions, I had to downsize my artwork significantly. So I began experimenting with different mediums, and I re-discovered the same old tubes of gouache that I’d bought for college all those years ago. Some of the tubes were pretty much dried up, but I discovered that I could rewet the paint with water! I found gouache a little tricky to work with at first. I had trouble getting the paint to spread easily, while still maintaining that beautiful bold finish that gouache is known for. It also took me a while to find the right paintbrush, and paper for the job, but once I did - the quality of my work changed overnight. I'm ready to share all of my tips, tricks and secrets with you, and I want to open a world of creativity and colour to you through gouache! I have no creative ability or talent at all. I can’t even draw stick men. Is this course too advanced for me? This course was designed with you in mind! This e-course is a great place to get started with gouache if you’re a beginner, or if you’ve been painting for a while with various mediums, but you haven’t tried gouache yet. Do I need to spend lots of money on supplies? I don’t believe that art should cost a lot of money! You will need some basic gouache colours, a paintbrush and a sketchbook or some watercolour paper. I always find that a good idea to try and make do with what you have as much as you can, because often this will lead to more creative solutions! It’s a completely self-paced online course, so you can decide when you start and finish. After enrolling, you have unlimited access to this course for as long as you like - across any and all devices you own. Does this course include a specific list of supplies? In this course I will be sharing the supplies that I like to use, and I’ll give you some different options so that you can gather the supplies that best suit your style and budget. Do I need to know anything about gouache to join? No, you don't even need to know how to pronounce 'gouache'! We will cover all of the basics! Starting a new hobby or trying something new can be intimidating. You might have a lot of questions, and suddenly be overwhelmed by all the unknowns. Many people quit before they even begin to try something new. It doesn’t need to be daunting though! A list of supplies, some easy to follow instructions, and some good guidance is all you need to get started with gouache! 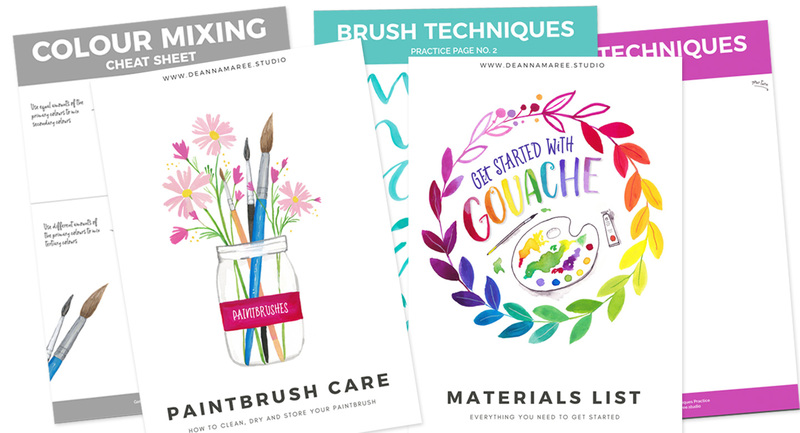 Join me in the Get Started With Gouache classroom, and I'll take you step-by-step through everything you need to know!